Plus Size Denim Shirts make a great addition to any wardrobe. It seems no matter what's taking place on the runway, denim tops never go out of fashion. You can dress them up or down and always feel comfortable. As you shop for your shirt, you'll discover that denim shirts come in a wide range of colors and styles. Dark blue and black are excellent for slimming, and nearly universal colors for matching to the rest of your clothing. Or, how about red, yellow or green denim? These don't look quite so formal but they certainly brighten up the closet without ruining your budget. 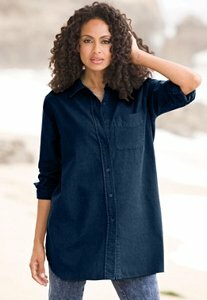 When choosing a plus size denim shirt focus on light weight fabrics. Thicker denim doesn't move with you – and the stiffness may accentuate some curves that you'd rather play down. Long sleeves or short? A lot depends on your arms. If you have good tone in your upper arms the short sleeve denim keeps you cooler. Overall long sleeve shirts seem more popular. Hint: try to find preshrunk denim fabric for your shirt. This way you can be certain it fits properly from the get go. Check the seams for good stitching that will last. Take a peek at the shirts that have decorated backs, single embroidered pockets in front, or other ornamental elements if you want a more formal look and feel. Add a pressed pair of cargo pants and heels, and you're ready for a night on the town. Denim is a very reliable fabric. When you invest in a plus size denim shirt you're getting something that's going to last you for a long time so avoid buying “trendy” designs. Even the simplest shirt looks great once you add a few touches like jewelry or scarves. Focus on simple and well-fitting. You don't want your shirt too loose as that makes you look large instead of sleek. Two of the most popular ways to wear denim shirts are as an overshirt and as a blouse/shirt. As an overshirt - or big shirt, as they are sometimes called, it is worn open with a tee-shirt or tank top underneath. This is a great look - add a belt if you have a nice waist. (Pictured on the right.) If you are hippy, you want the top to end below your widest point. You can also wear your denim shirt as a regular shirt or blouse - pictured on the left. When wearing it this way, a good fit is more important. You can find them in regular and tunic lengths and a variety of different denim shades and even seasonal colors. Once you own a denim shirt you'll wonder how you ever managed to live without one in your apparel line up. They're so versatile, comfortable and durable – hey why not get two? Have one in another color than your first for more diversification for daily clothing picks. You might want to look into matching denim skirts, pants, and handbags too. Plus size denim shirts are fun. There's a playfulness in the way denim looks and feels. Enjoy it!